Mysticism, nature and adventure in four different Xenotes. 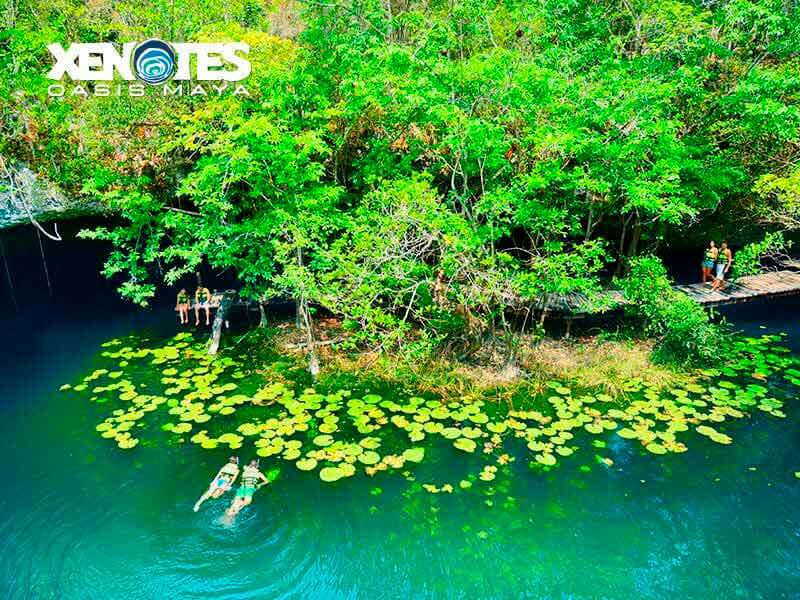 The Xenotes Tour combines the excitement of a trip to the heart of the jungle, the four types of cenotes that exist in the world, and the interaction with nature, through adventure activities in each one of the freshwater pools. 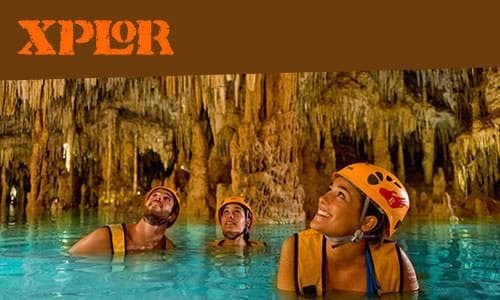 Descend by means of assisted rappel until you arrive at the blue waters of Lu'um, a cavern cenote that’s surrounded by million-year-old rock formations. Feel the adrenaline rush as you zip-line over Iik', an ancient cenote where you can also cliff jump from a height of more than 20 feet to immerse yourself in its refreshing waters. Admire the beautiful underwater gardens of Ha', a semi-open cenote where you can also kayak among its vertical rock walls of hanging vegetation. 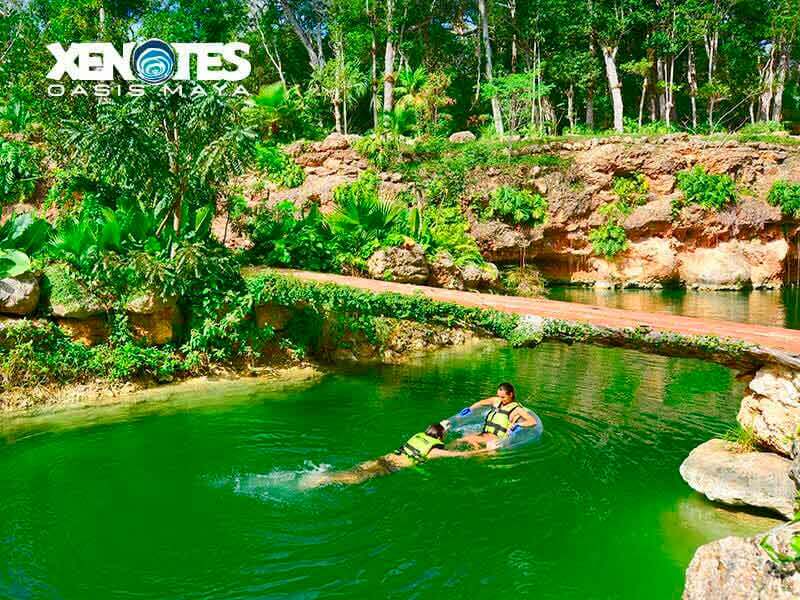 Enjoy the landscape of K'áak', an open cenote surrounded by vast vegetation, ideal for swimming and relaxing on an inner tube. The Xenotes Tour is performed in small groups, with personalized attention from lifeguards and photographers, and an entertaining guide who will accompany you from the moment you board your transportation, and will be in charge of orienting you at each activity, as well as letting you know all about the legends of the cenotes and the importance of their preservation. 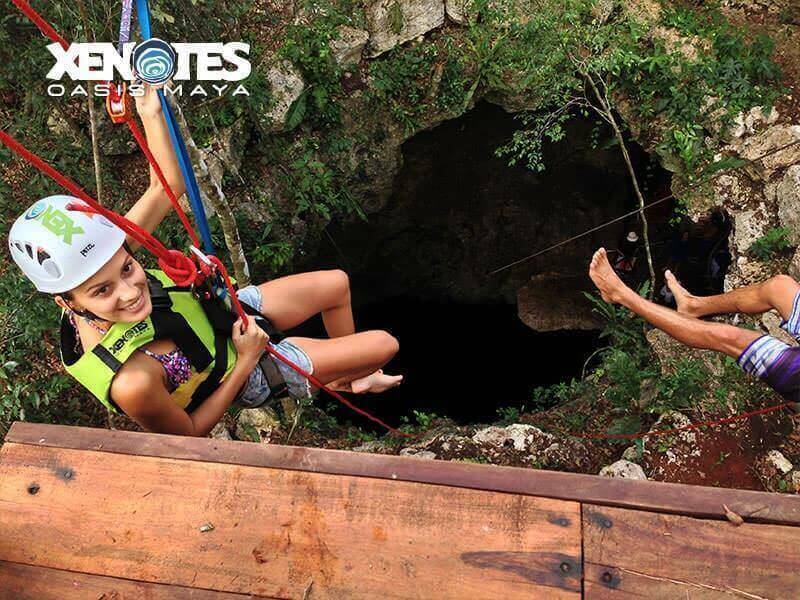 Discover the secrets of nature at Xenotes! 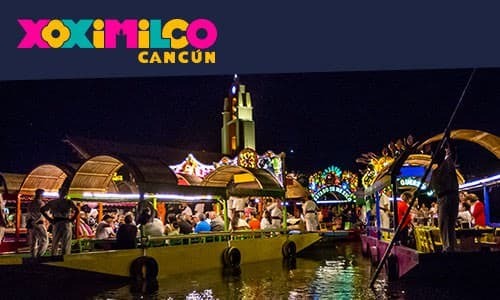 Your tour includes hot and cold drinks, fresh fruit, Mexican sweet bread, and an exquisite picnic in the middle of the jungle with gourmet sandwiches and wine and beer. Between 8:00 a.m. and 10:00 a.m. depending on the location of your hotel. *Must show an ID at the Park’s ticket booth. Round trip transportation with certified guide. 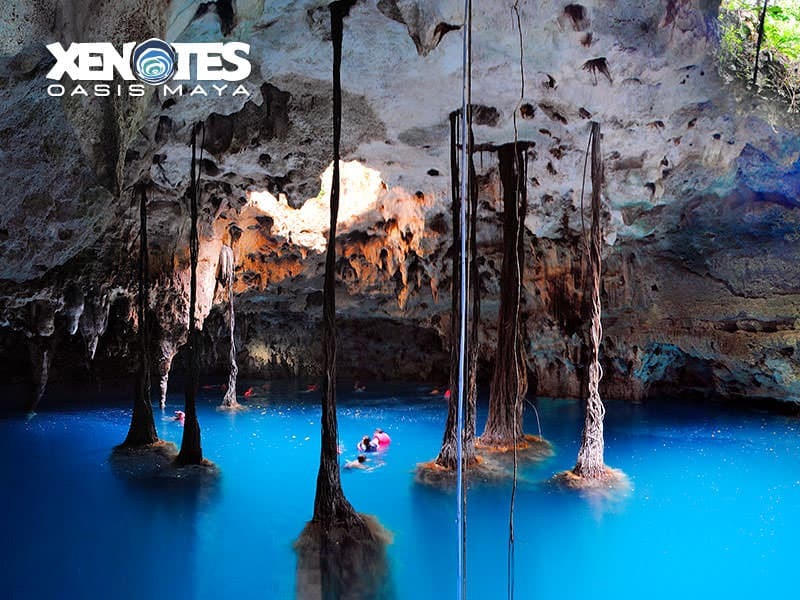 Visit to the four different types of cenotes that exist. Assisted rappeling into Lu’um, a cavern cenote. 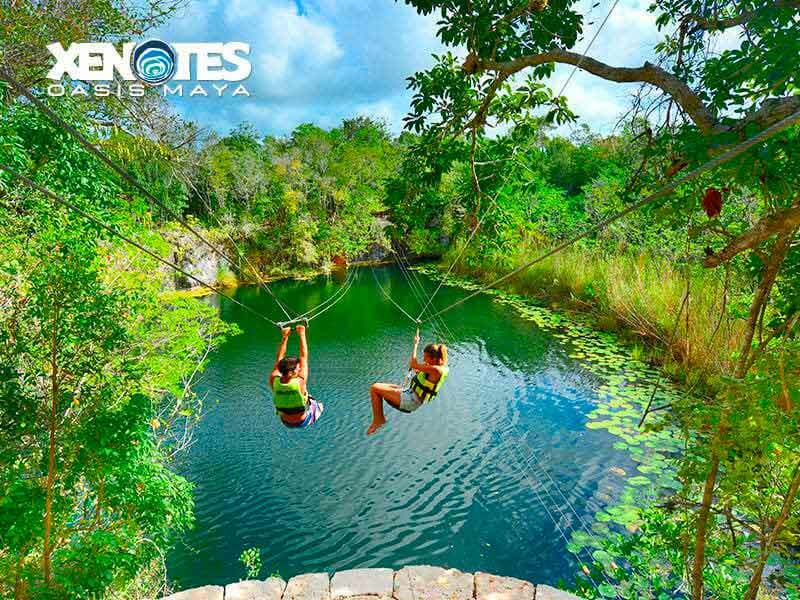 Zip-lines and cliff jumps at K’áak’, an open cenote, and at lik, an ancient cenote. Kayaking through Ha’, a semi-open cenote. Exploration swimming in Ha’, a semi-open cenote. Cold and hot drinks (waters, sodas, Mexican-style hot chocolate, coffee), as well as seasonal fruit at the end of the first cenote. Jungle picnic that includes julienne soup, cold bar of meats and premium cheeses, variety of rustic breads, dressings, salads, water, wine and beer. Equipment: life jacket, swim mask, rappel gear, kayak and inner tube. Restrooms, showers, changing rooms and towels. Always confirm pickup location and time. Bring aquatic shoes, swimsuit, and a change of clothes. Avoid the use of makeup, perfumes or repellents with chemicals that may affect the ecosystem of the cenotes; you should take a shower before entering the first cenote. Avoid leaving marked or pre-established paths to prevent an incident with the fauna or flora of the jungle area,. If an animal is observed, avoid touching it, approaching it or feeding it. Remember, they are in their natural habitat. Bring a credit card or cash to purchase photographs or souvenirs of your Tour. Minimum age for Xenotes is 6 years. NOTE: For the zip-line activity a minimum height of 4.5 ft (1.4 m) and a minimum weight of 88 lbs (40 kg) is required. The use of the life jacket is mandatory during all water activities. This tour is not recommended for people with heart conditions, or that of lungs, spine, asthma, diabetes, hypertension, or pregnant women or those suspected of being pregnant. 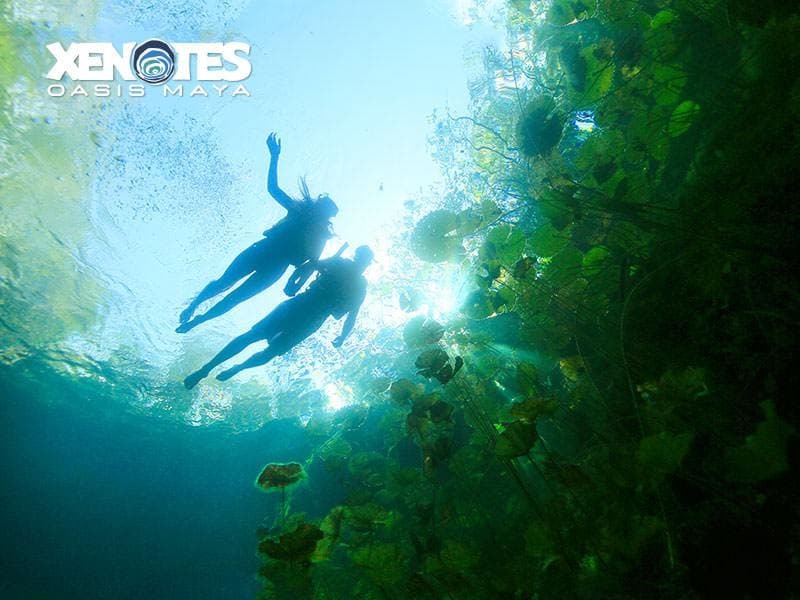 The average water temperature of the cenotes is 75 to 78° F throughout the year. Please take into account that the cenotes are located in the middle of the jungle, so some roads to reach them are not paved and could be bumpy. Also be aware that due to the location of the cenotes in the middle of the jungle, cell phone service is likely unavailable. 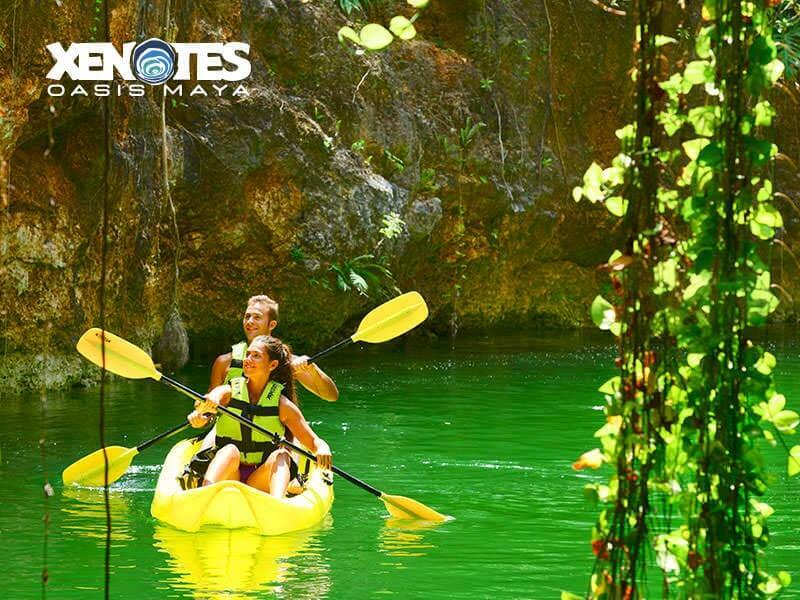 Xenotes Tour, You’ve never experienced nature like this. Includes all photos of a group of up to 10 people registered at the same purchase. Price depends of the number of guests and parks selected at the time of purchase. For more than 10 visitors, it must be purchased at the Park's ticket booth. click here. *Recommended for children ages 6 and older. Children from 6 to 11 years old pay 50% of the adult price. 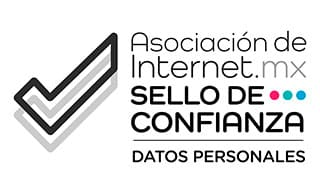 -10% OFF purchasing 1-20 days in advance. -15% OFF purchasing at least 21 days in advance. Prices are subject to changes without prior notice. Restrictions apply. Childs since 6 to 11 years old -50% off from adult price.